نقی زاده, محمد. (1392). جلوه‌های زیبایی در باغ ایرانی. مجله علمی-ترویجی منظر, 5(22), 6-9. محمد نقی زاده. "جلوه‌های زیبایی در باغ ایرانی". مجله علمی-ترویجی منظر, 5, 22, 1392, 6-9. نقی زاده, محمد. (1392). 'جلوه‌های زیبایی در باغ ایرانی', مجله علمی-ترویجی منظر, 5(22), pp. 6-9. نقی زاده, محمد. جلوه‌های زیبایی در باغ ایرانی. مجله علمی-ترویجی منظر, 1392; 5(22): 6-9. باغ یکی از آثار انسانی است که به عنوان عامل هویّتی و نمایش عینی باورهای جامعه ایفای نقش می‌کند. غرض از باغ‌سازی هر چه که باشد یکی از پیامدهای محتوم آن زیباآفرینی است؛ با عنایت به ارتباط تنگاتنگ باغ ایرانی و زیبایی، شناسایی اصول حاکم بر زیبایی باغ ایرانی و مبانی آن مراتب زیبایی این باغ‌ها هدف اصلی پژوهش حاضر است. با عنایت به این که برای موضوع مقاله (باغ) صفت ایرانی ذکر شده، روش اصلی، تفسیر و تحلیل متون و همچنین تحلیل آثار موجود خواهد بود. Garden is one of the things made by human being that has a crucial role in giving identity to the society and the materialization of social beliefs. The philosophy behind the creation of gardens may be to give life to one of manifestations of beauty. Considering that the Persian garden has a close connection to beauty, it may be necessary to realize the principles which contribute to the beauty of the Persian garden. This is what the present research has targeted. The research methodology will be interpreting the available texts regarding the Persian garden as well as studying the remaining gardens in Iran given that the main scope of study has been described as Persian (Iranian) gardens. The Persian garden is a manifestation of supreme values and concepts. Some have described the Persian garden as “a representation of heaven” (the Qur’anic heaven). The present research is not meant to deal with the representation of heaven in Persian gardens. Rather, it tries to address the roles of certain elements of the Persian garden as manifestations of heavenly symbols or spiritual values. It is general knowledge that all elements of nature create the image of supreme concepts in the minds of individuals, specifically Muslims and Iranians. Nonetheless, even though supreme concepts are associated with natural elements, studies have shown that the gardens in which the elements have been taken away from their natural forms are more efficient in creating the heaven effect. 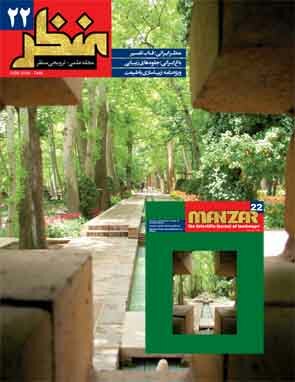 Overall, the main elements of Persian gardens, as investigated by researchers, are creating a sense of moral values and tranquility, establishing an association with history, simplicity, variety of plants, unique geometrical designs, symmetry, balance, accordance, boundary and beauty. What the present research established was to show that despite what holds true with numerous cases, beauty cannot be merely dependent on what is perceived through the common means of the material world. The Persian gardens - which vary over a wide range from traditional gardens to the landscape areas around castles and even those inside house yards – are no exception to this. Rather, they represent various manifestations of quality beauty which is related to the spiritual world and heavenly beauty which is related to the supreme aspect of life. Both of these stages of beauty that overlap each other have led to the creation of unique cases of Persian gardens across the history by relying on the genuine Persian culture as well as the monotheist ideologies. In conclusion, it is regrettable to see that all the beauties as visible in Persian gardens are not taken into consideration in the modern architecture of Iran and the country’s architecture is still mainly focused on foreign models.